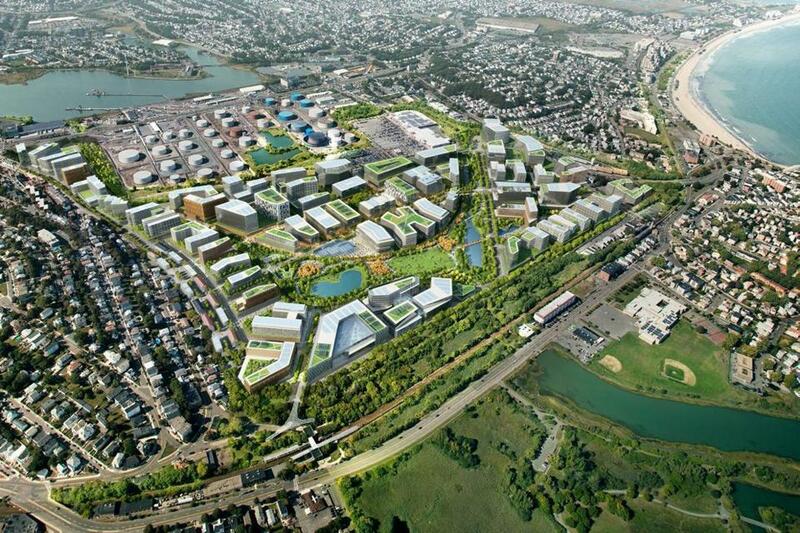 Boston’s proposal for Amazon’s HQ2 includes this rendering of how Suffolk Downs might look if it became the company’s second campus. I’ve been following Amazon’s ascendance since 1997, when I interviewed the founder — not yet a household name — for Fast Company magazine. Jeff Bezos and I swapped holiday gifts for a Globe story about Amazon’s “wish list” feature in 2001. In 2011, I broke the news that Amazon was opening its first white-collar outpost in Massachusetts, hiring PhD computer scientists and software smarties who were reluctant to move to Seattle. In 2015, I told you what some of those new hires were working on: speech recognition for Amazon’s Echo line of intelligent speakers. So this is a company I’ve been tracking closely for two decades now. Here is my list of five things that will happen if Amazon chooses Massachusetts for the site of its second headquarters, dubbed HQ2, and five things that will happen if it chooses a different place. And I’d love to hear your take on where I’m wrong. Post a comment or drop an e-mail to the address at the bottom, and I’ll collect your thoughts in a future column. 1. The value of higher-end housing in that city instantly pops 20 percent. Wages at every tech-savvy employer within 40 miles start to creep up, though not as dramatically. While the tech entrepreneurs and venture capitalists I’ve spoken to in recent weeks believe Amazon HQ2 will be a “rising tide” that would bring more talent to Massachusetts and have a positive effect, it’s going to make the kind of tech and managerial talent that Amazon wants more expensive and harder to retain for everyone else. 2. Massachusetts politicians chasing the company will soon realize just how insular and secretive Amazon is. I often compare it to Willy Wonka’s chocolate factory. They sometimes invite people in — to hire them or pitch them to be customers or collaborators — but the current headquarters in Seattle is not a very permeable place. In Cambridge, tech giants such as Microsoft and Google have been major contributors to the business ecosystem, hosting events at their offices and regularly speaking at industry conclaves. Much of what makes the innovation economy work in Massachusetts is that there’s a lot of schmoozing and interplay between entrepreneurs, investors, and execs at larger companies. By contrast, Amazon works employees incredibly hard and creates lots of hoops to jump through every time they want to speak at a conference or college. 3. Every retailer in the state will feel like Massachusetts has declared war on their industry, by offering financial incentives to attract retail’s most powerful disruptor. As street-level boutiques, malls, big box stores, and mom-and-pop shops continue to close, the officials most associated with bringing Amazon to town are going to have that affixed to their legacy. (That might not be fair; Amazon and other e-commerce players are simply making shopping more efficient.) Former employees of those retail establishments are not likely to have the skills to be hired at Amazon’s HQ2. Retraining them and finding them new jobs is going to be a problem for the decade ahead, whether or not Amazon comes to Massachusetts. But it’ll be a more visible one with HQ2 here. 4. Amazon will get the blame for every traffic backup and jammed bus or train. But it will deserve some credit, too: This is a company that in many ways (positive and negative) is redefining the economy, from warehouses to drones to brick-and-mortar retail to consumer electronics to cloud-based services. Its presence here will force other companies to be more nimble to avoid getting “Amazoned.” It will also force our educational institutions to consider the kinds of jobs Amazon is hiring for, up their game, and adjust the skills they teach. 5. The state’s tech community will get a “major infusion of consumer knowledge,” in the view of a former Amazon executive I spoke with. Translation: For time immemorial, Massachusetts tech companies have mostly sold software, hardware, and services to businesses. We haven’t grown lots of companies like Apple, Etsy, eBay, or Amazon here, with deep understanding of how consumers buy and how to design products for them. Amazon’s HQ2 would pull a lot of that talent to Massachusetts and presumably make the soil more fertile for other companies targeting regular folks rather than chief information officers. 2. It would instantly turn another East Coast-ish city — like New York, Washington/Baltimore, Atlanta, or even Pittsburgh — into a top-tier tech hub. 3. Serious, high-profile conversation about investing in public transportation and more affordable workforce housing will stop cold until the next company comes along shopping for a headquarters location. 4. It would be constructive to spend some energy thinking about how the tech sector and retailers in Massachusetts could support one another, helping retailers better compete with the likes of Amazon. We can all name neighborhood shops that still don’t list their hours on their website or don’t understand the importance of having an e-mail newsletter or managing their customer reviews on sites like Yelp and Google. For heaven’s sake, Market Basket just launched its first website this week. Industry associations and city chambers of commerce could do a lot to support more interaction between tech companies and retailers. 5. Many of us hope HQ2 would go to Rhode Island. Little Rhody could use a boost, the governor is a former venture capitalist, and coffee milk, the official state drink, is sort of like a weak Seattle double-shot espresso. The odds are long, but Rhode Island educates a lot of smart people, housing is inexpensive relative to Massachusetts, and winning HQ2 would be transformative. When will we know about Amazon’s decision? When they’re good and ready to announce it. The smartest thing I’ve heard about how the company will choose was an offhand comment from Colin Angle, chief executive of iRobot Corp. in Bedford and someone who has been mentored by Bezos. If Bezos makes the call, Angle told me earlier this month, Boston wins because of our talent. If someone else at Amazon (or a committee) decides, another city wins based on the aggregate analysis of many different factors. But what do you think? Drop me a note or post a comment.